Hi, today i’ll explain a simple way to load Google maps. But there is a limitation with this method as this way you can only view the data already available with the Google maps. Here you can just use the Activity class of android.jar. If you want to add additional locations you have to use the classes comes with the Google APIs by Google Inc. This method let you find any location on the Google maps by street, city and country. You can use an instance of the Intent class in this case. Intent class is usually uses to launch an Activity from another Activity. Here you can pass a String of the location details as data to the Intent instance, via Uri.parse(). Now when you start the Activity, it starts searching the address we specified in the String by street, city and country. First of all you can create a form which takes three texts as inputs with a button in the layout file (.xml). Then in your Activity class set the name of the xml file you created in the setContentView() method as follows. Next create instances of each UI component by giving their id inside the onCreate() as follows. When the button is clicked, get the values of each input field and create a single String separated from “,” using concat(). Now pass this String as a parameter to the instance of Intent and call the startActivity() as follows. When you run this application on the emulator and click on the button the Google map will be loaded at the location you specified as follows. The image of the marker keeps in the resource folder. So, first of all we have to create a Drawable object using that image. The location which we need to put the marker is included in a GeoPoint object. This GeopPoint is an Overlay item which we place on the overlay of map. When we creating an OverlayItem in addition to the GeopPoint we add some other information about the location as well. The marker is actually created at the point we add the OverlayItem to the ItemizedOverlay. Finally this ItemizedOverlay is added on to the Overlay on the map view. Today I’ll explain how to load the Google map on to your device. When creating a normal android application you are using the Activity class but here you have to use the MapActivity class. The following code segment shows the implementation of the MapActivity class. In addition to this class you have to write the xml file to create the interface. The xml file should include the following tag. You will have to replace the apiKey with the new Map API key you have obtained. 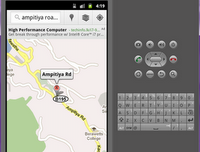 When you run the application on the emulator or on the device the Google map will be displayed as follows. But if you haven’t give the internet permission or else the internet connection is low or disabled it will display only a grid instead the map. The Map API key is a unique key provided by the Google for free. Therefore each developer has to get a new API key for their machine for the debug purpose. 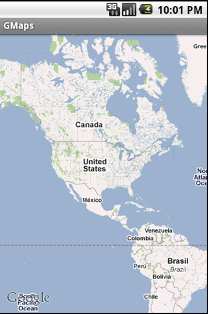 Otherwise when you deploy the application on the emulator it will just display an grid without the Google maps. The .android folder is usually located in the Documents folder. This folder is automatically created when you run an application on the emulator for the first time. This folder contains the debug.keystore file. 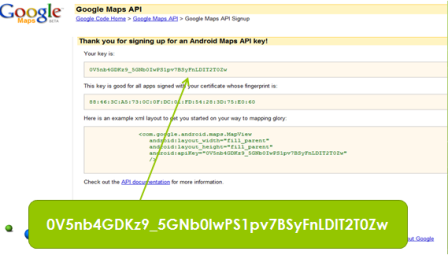 Now sign up for Google android apikey site https://developers.google.com/android/maps-api-signup and get the Map API key using the Certificate finger print you received. 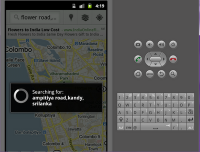 When creating a map application for Android device, you have to use the Google APIs by Google Inc as I have mentioned in a previous post .This Google APIs includes maps.jar in addition to android.jar. The maps.jar contains the following classes which are necessary in creating a map application. Need to extend MapActivity instead Activity for the main class. Need to update the AndroidMainfest.xml with following tags. 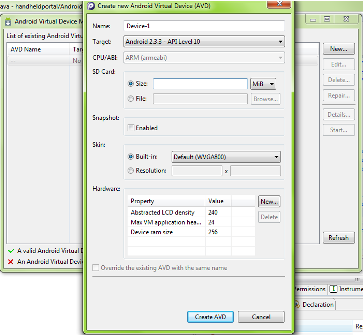 The (Android Virtual Device) AVD Manager downloaded with the SDK can be used to create virtual devices to test the android applications. First, run the AVD Manager icon in the Eclipse IDE. Now you can create an Emulator by giving the following attributes. You can change the ram size, density and heap or add any new property in Hardware as you wish. 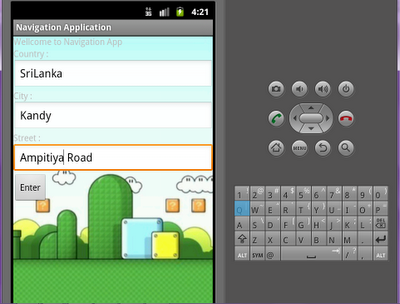 Select the application and choose the “Run Configuration” from the menu item “Run”. Now you can select a virtual device which is compatible with the target SDK version, from the list of devices available. The devices you have created using the AVD Manager will be added to this list. There are two types of API s available with Android for a particular version of platform. They are the Android API and the Google API. As an example the Android API level 15 includes Android 4.0.3 API and the Google APIs for the same platform 4.0.3. 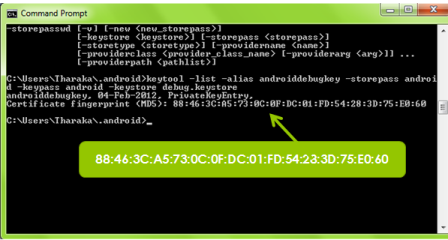 If you install only the SDK Platform of the Android 4.0.3(API 15) using the Android SDK Manager you can create a normal android application. But if you want to create a Map application you’ll have to install the Google APIs by Google Inc. The reason is that the normal Android API contains only the android.jar and in the Google APIs it provides the maps.jar in addition to the android.jar. You can create a simple android application by following the steps below. 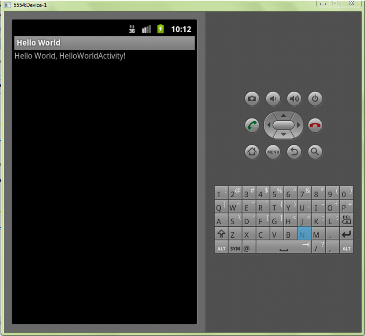 Select File -> new project ->Android ->Android Project -> fill the project details in the new window. 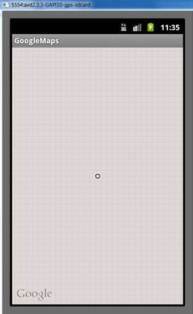 Select Built target : Android 2.3.3 (API 10) – This will define the target SDK . This is usually the android SDK compiled against and used to indicate version the developer primarily tested and designed for. Min Version: 4 – This will define minimum platform version supported by the application.